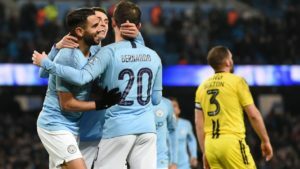 After bursting with the biggest shame in their history, Burton has this Wednesday, January 23, an opportunity to try to improve their image a bit in the return match of the English League Cup semi-finals against Manchester City. The match, scheduled to start at 17:45 (GMT), will be held at Pirelli Stadium in Burton-upon-Trent.The competition is played with unique and eliminatory games in almost all its phases. The only exception is the semi-final stage, which has round-trip duels. In that case, the one who scores the most points goes to the decision. In case of a tie, goals and goals scored as visitors are taken into account as tiebreaking criteria. If no definition occurs, the decision is made in penalty kicks.In the first game in Manchester, the hosts of the house applied a rout of 9 to 0. In that way, will ensure if place in the final, which will be against the winner of Chelsea and Tottenham, who will make the second game of the showdown on Thursday , January 24, if they win again, draw or lose by up to eight goals difference. If they score, they can suffer a nine-goal margin loss that will still decide the Burton title, reversing the situation requires success with ten or more goals. Not even the most optimistic Burton fan believes the team will be able to reverse the situation. So the game will serve only and only to try to improve the shaken image of the team after the Manchester massacre.The team certainly felt the impact of the result. He has not been able to win since. In the League 1 match, the English Premier League third division, three days after the match in Manchester, took home 3-2 Gillingham.With a little more time to assimilate what happened, on Saturday, January 19, as a visitor, managed to tie, by 2 to 2, with Doncastar. He achieved 36 points (ten wins, six draws and 12 losses). He is in the thirteenth place in the League 1 standings table.It does not have many pretensions in the dispute. The tournament takes the first two places directly to the Championship. This block is closed by Luton, who has 20 points more than the Burton. A third place is reserved for a playoff that will be played by teams that are between the third and sixth positions at the end of 46 rounds. This peloton has as limiting Peterborough, who is 11 points ahead of Burton.Thus, the team must even focus on staying out of the relegation zone, which is opened by Plymouth, twenty-first with six points less. The thrashing applied in the match by the City practically reduced a game in an intense calendar. For Wednesday’s meeting, coach Pep Guardiola will most likely put an entirely reserve team on the field using even athletes who are often not even related to the bench.After all, the team continues in the fight in three other competitions. In the English Premier League, they thrashed Huddersfield at home to 3-0 on Sunday. He reached 56 points (18 wins, two draws and three losses). He is in second place with four handicap points in comparison to Liverpool, leading.In the Glass of England, also debuted with a thunderous defeat. At home, he scored 7-0 at Rotherdam. His second opponent in the tournament will be Burnley. The duel is scheduled for next Saturday, January 26. The fourth battlefront will be reopened on February 20. City will have Schalke as their rival in the Round of 16 of the Champions League.Guardiola has a wide cast to choose from this Wednesday’s showdown. Among the athletes of the squad only are not available the goalkeeper Claudio Bravo; and defenders Vincent Kompany and Benjamin, delivered to the care of the medical department. The first leg of the English League Cup semi-finals was the first meeting involving the teams. The first leg accurately reflected the technical gap between the teams. For the meeting on Wednesday, this distance will decrease by two factors. The first is the fact that the City puts the reserve team to act. The second is the clear lack of interest of the Manchester team in the match, which has become a nuisance imposed by the calendar.Burton, on the other hand, has reason to show service. After all, you have to give an answer after the massacre. Thus, while the opponent sees the match as friendly, it should act as if it were an official match. This opens the door to a risky guess in the prognosis of homeowners’ victory, although it certainly should not be enough to change the situation in relation to the classification for the decision.